Comfortable and spacious 2 bedroom cottage in a tranquil rural environment. Large picturesque trees line the driveway on arrival. Guests can relax and walk in the garden amongst oak, walnut, cherry blossom and Himalayan Cedar trees. Plus enjoy all day birdsong from the Tui’s and Bellbirds. The cottage living area gets plenty of morning and afternoon sun and looks out to the garden. The kitchen is well equipped and includes a kettle, toaster, oven, and fridge/freezer. There is a peak of Mount Ruapehu from the kitchen window on a clear day. A Queen bed is in the main bedroom, and there are two single beds in the second bedroom. A washing machine is also available. Ideally located to explore Taupo and the surrounding area. 15 mins north of Taupo en route to Hamilton and Rotorua. Convenient location for an overnight stop when travelling through the North Island. 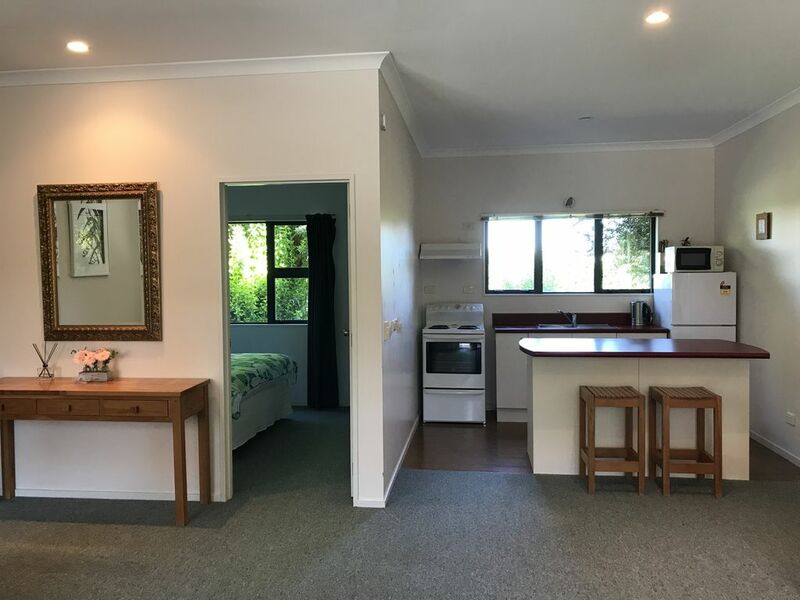 Close to tourist locations such as Huka falls, Aratiatia dam, National Equestrian Centre, Huka Prawn Park, Craters of the Moon and many bike and walking tracks. Very handy to Taupo, with its beautiful lake and abundance of restaurants, cafes, boating and fishing. Handy spot close to the major attractions whilst enjoying peace and tranquility of isolated and private accommodation. Also ideal for the traveller passing through - north or south. Can also accommodate longer term visitors at very reasonable prices. The cottage was huge, the pictures do not make justice to it. The cottage was huge, the pictures do not make justice to it. It was clean and the surroundings are beautiful. Easy to deal with and the place was great. A very comfortable Bach with every thing you could need. A very comfortable Bach with every thing you could need. We will definitely return when we are in the area. This house was exactly what we needed, a perfect set up for a family, much bigger that the photos looked I thought. About 15 minutes from Taupo and it was lovely to be away from all the Easter chaos! The property is surrounded by established trees and very private. The house was stocked with yummy treats and was extremely tidy. My 4 year old loved exploring the outdoors and we loved being away from the city. The bach is clean, spacious and warm, and is in a beautiful setting.